Last weekend, a friend posted images of Oxford in 1962 and Charlottesville in 2017 side by side with the caption “The names have changed, but the racism remains the same.” Both images feature white men with mouths open, most likely shouting words laced with hate and anger; the menacing light cast on the Charlottesville marchers by their tiki torches provides the only dramatic contrast between the two images—a more blunt evocation of their racist mission. While Americans have taken much comfort in the idea that we’ve made considerable progress toward equal civil rights since the 1960s, events like the “Unite the Right” rally in Charlottesville tell us how far we have yet to go. And we cannot move beyond the past unless we confront its unseemly components head on. An illusion of calm and harmony are not the same as true racial reconciliation. In the background of Friday night’s alt-right march at the University of Virginia were the columns of Thomas Jefferson’s Rotunda, a grand structure that brought to mind for me the Lyceum at the University of Mississippi, as well as the Ole Miss riot during its integration fifty-five years ago. Although I was only five years old at the time, the images of that riot are seared in my consciousness by way of the pages of the Life and LOOK magazines that were a constant presence in my household. Seeing images connected with memories of my childhood led me to ponder how much had actually changed in the past half century. Did the changes I thought I had witnessed actually happen? It’s the same feeling I had as a student at Ole Miss, using the Lyceum as a shortcut to classes more than forty years ago. The rabid faces defending white supremacy, the guns and violence seemed to rush into my mind almost daily, reminding me of the past. I always knew that blood had been shed to allow me to take that shortcut. For years there was silence at Ole Miss about the violence that took place in the shadow of the Lyceum’s white columns, even though the bullet holes from the gunfire used to quell the riot were still evident for anyone to see. Up until twenty-five years ago, vestiges and relics of the riots were only spoken about in a whisper; now there are interpretive markers that tell the story with a measure of accuracy. Yes, Ole Miss has been slow to reckon with its past—a reckoning that has required a continuous process, because the denial of history is constant. Today we live in an ahistorical era filled with illusory facts and realities. Myths and lies are issued from the highest levels of government and presented as truth. What happened in Charlottesville is a tragedy, but the city and the University of Virginia cannot move forward without taking a closer look at their history and placing the events of last week in their proper context. That process must begin now, before the forces that marched on Charlottesville and UVA become more menacing, forceful, and powerful. As Genet said, “fascism is theater.” But to deal with the aftermath of the “Unite the Right” march, the focus must not be placed on image. It must be about unfiltered reality. This is a difficult task, but it is crucial to the work that must be done. That work begins on the idyllic grounds of the University of Virginia. Jefferson’s academical village of red brick and white columns always felt stony and distant to me, a bit like the third president himself. A statue of Jefferson looms in front of the majestic Rotunda, seeming to cast a watchful eye over the grounds of the university he founded. Yet the Rotunda casts its own shadow, masking the more unsavory elements of its past. Is it Jefferson’s past as a slaveholder or the slave labor that constructed the grounds that’s being hidden? Or is it his moral relativism? Of course, none of these facts are secret, yet today the grounds bear no markers or acknowledgment of this history other than a small plaque outside the Rotunda. A place maintained and preserved to evoke another era can easily fall into a hagiographic idea of the past rather than confront historical realities. Sometimes recent events can reveal what has been a hidden subtext. The way the present aligns itself with the past often reveals how a culture hides from harsh historical realities. “We risk being the first people in history to have been able to make their illusions so vivid, so persuasive, so ‘realistic’ that they can live in them,” historian Daniel Boorstin wrote in 1961, a year before the Ole Miss riot. 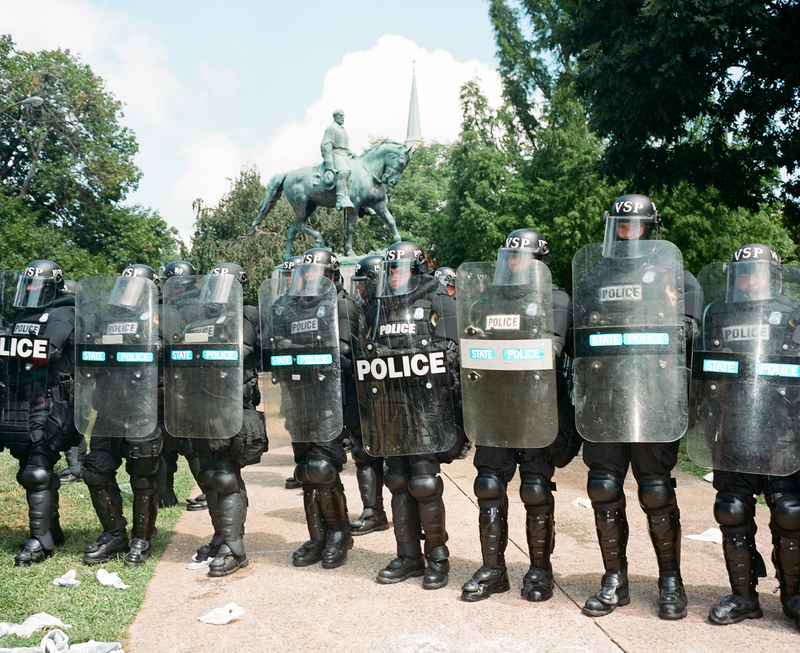 Both Charlottesville and UVA are places that have been enraptured with image, rather than grappling with the complex history that created the image. The white supremacists and alt-right neo-Nazis who led Saturday’s “Unite the Right” protests are not Charlottesville. Residents of Charlottesville did not want the rally nor did many of them support it. But the image the marchers created will come to be linked with the city unless there is some real soul searching as to why the marchers chose Charlottesville as the setting for what they call a “moral victory” for their white supremacist movement. They came to Charlottesville to object to the removal of a Robert E. Lee statue in a park that has only recently been renamed Emancipation Park. The great irony of this refreshed moniker is that a Confederate general who fought to defend slavery still looms over the space. While the Charlottesville city council voted for its removal, a lawsuit has kept the statue in place. As any Southerner with a grip on reality knows, the Lee statue and others like it served as racial markers and defined spaces where black residents were not welcome. Thus the racially heated debate about the statue’s removal. But that debate is now obscured by a nighttime rally that could have been choreographed by Leni Riefenstahl for Triumph of the Will. Again, image has overshadowed a more substantive issue at hand. Instead of choosing the Lee statue as the site for Friday night’s rally, the “Unite the Right” marchers chose Jefferson’s Rotunda. This was a strategic decision. The image of ramrod-straight men carrying torches, giving Nazi salutes, and shouting racial epithets means that whoever made the decision to have the Rotunda as a backdrop—perhaps it was UVA alumnus and white supremacist Richard Spencer—sought to use a spectacular and meaningful place—a World Heritage Site—to promote a profoundly unethical movement. It cannot be accidental that a group rallying to protect a statue that promotes the idea of the “Lost Cause” would stage a rally on a spot based on the myth of the Jeffersonian ideal. The University of Virginia proudly proclaims its link to Jefferson, yet it rarely deals with the complexities of this legacy. This is not only the fact that Jefferson owned slaves, but also that his ideas were often elusive, opaque, and contradictory, leading different schools of thought to use Jefferson to promote all kinds of different arguments, including white supremacy. Some argue that the genius of the Jeffersonian idea of government is that it can be so many different things to so many different people. Why, then, was Charlottesville, the home of founding father Thomas Jefferson, the setting of such a repugnant protest? Because Jefferson’s political philosophy is so malleable. It can be contorted to support a vast number of positions. The leaders of the march knew that. Last weekend’s protest revealed the dark side of Jefferson’s legacy, something the University of Virginia has long been reluctant to confront. But now it must finally reckon with what that legacy means to a twenty-first-century institution of higher learning instead of focusing on its nineteenth-century idea of itself. The historical myth of the Jeffersonian ideal was used by the “Unite the Right” marchers as a tool for the radical transformation of reality. History and myth became theater. And the actual historical context for that backdrop was obscured in the process. Perhaps if the university had not hesitated to confront its legacy of slavery and the myth of Thomas Jefferson long ago it would be harder to link the past to the present. No circular stone memorial to enslaved workers will erase the candlelit image of white supremacists giving Nazi salutes in front of the Rotunda. Perception is not a passive act. W. Ralph Eubanks is the former editor of the Virginia Quarterly Review. He is the author of Ever Is a Long Time: A Journey Into Mississippi’s Dark Past (Basic Books, 2003) andThe House at the End of the Road: The Story of Three Generations of an Interracial Family in the American South (Harper, 2009). A 2007 Guggenheim Fellow, his essays and reviews have appeared in the Washington Post, The American Scholar, and National Public Radio.